The Dominican Republic has the largest economy in Central America and the Caribbean. It is an upper middle-income developing country, with a 2007 GDP per capita of $9,208, in PPP terms, which is relatively high in Latin America. In the trimester of January–March 2007 it experienced an exceptional growth of 9.1% in its GDP, which was actually below the previous year's 10.9% in the same period. Growth was led by imports, followed by exports, with finance and foreign investment the next largest factors. The D.R. 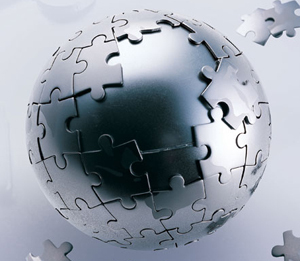 is primarily dependent on natural resources and government services. Although the service sector has recently overtaken agriculture as the leading employer of Dominicans (due principally to growth in tourism and Free Trade Zones), agriculture remains the most important sector in terms of domestic consumption and is in second place, behind mining, in terms of export earnings. The service sector in general has experienced growth in recent years, as has construction. Free Trade Zone earnings and tourism are the fastest-growing export sectors. Real estate tourism alone accounted for $1.5 billion in earnings for 2007. Remittances from Dominicans living abroad amounted to nearly $3.2 billion in 2007. Economic growth takes place in spite of a chronic energy shortage, which causes frequent blackouts and very high prices. Despite a widening merchandise trade deficit, tourism earnings and remittances have helped build foreign exchange reserves. The Dominican Republic is current on foreign private debt. Following economic turmoil in the late 1980s and 1990, during which the gross domestic product (GDP) fell by up to 5% and consumer price inflation reached an unprecedented 100%, the Dominican Republic entered a period of growth and declining inflation until 2002, after which the economy entered a recession. This recession followed the collapse of the second–largest commercial bank in the country, Baninter, linked to a major incident of fraud valued at $3.5 billion, during the administration of President Hipólito Mejía (2000-2004). The Baninter fraud had a devastating effect on the Dominican economy, with GDP dropping by 1% in 2003 while inflation ballooned by over 27%. All defendants, including the star of the trial, Ramon Baez Figueroa, were found guilty and convicted; one subpoena failed to be delivered upon the United States denial of extradition. According to the 2005 Annual Report of the United Nations Subcommittee on Human Development in the Dominican Republic, the country is ranked #71 in the world for resource availability, #79 for human development, and #14 in the world for resource mismanagement. These statistics emphasize national government corruption, foreign economic interference in the country, and the rift between the rich and poor. 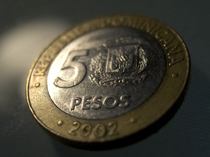 The Dominican peso (DOP, or RD$) is the national currency, although United States dollars (USD) and euros (EUR) are also accepted at most tourist sites. The U.S. dollar is implicated in almost all commercial transactions of the Dominican Republic; such dollarization is common in high inflation economies. The peso was worth the same as the USD until the 1980s, but has depreciated. The exchange rate in 1993 was 14.00 pesos per USD and 16.00 pesos in 2000, but it jumped to 53.00 pesos per USD in 2003. In 2004, the exchange rate was back down to around 31.00 pesos per USD. As of February 2009 the exchange rate was 1 DOP = 0.0281 USD, i.e. 35.65 DOP per USD; 1 DOP = 0.022 euros (EUR, or €); and 1 DOP = 2.74 Japanese yen (JPY, or ¥). Tourism is fueling the Dominican Republic's economic growth. For example, the contribution of travel and tourism to employment is expected to rise from 550,000 jobs in 2008—14.4% of total employment or 1 in every 7 jobs—to 743,000 jobs—14.2% of total employment or 1 in every 7.1 jobs by 2018. With the construction of projects like Cap Cana, San Souci Port in Santo Domingo, and Moon Palace Resort in Punta Cana, the Dominican Republic expects increased tourism activity in the upcoming year. Ecotourism has been a topic increasingly important in the nation, with towns like Jarabacoa and neighboring Constanza, and locations like the Pico Duarte, Bahia de Las Aguilas and others becoming more significant in attempts to increase direct benefits from tourism.